The Gold Tone WL-250 Whyte Laydie produces the plunky yet focused tone that’s long been a standard for Old Time and folk music. 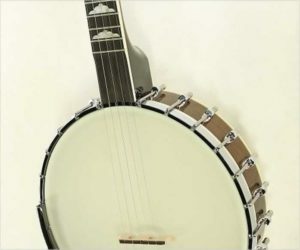 This banjo features an accurate replica of the classic three-piece Whyte Laydie tone ring, mated with a half-inch maple rim for maximum air chamber volume. The maple neck has a vintage heel design, a Fairbanks-style headstock shape, GT Master planetary tuners. Stylized cloud inlays adorn the bound ebony fretboard which terminates in a frailing scoop. The eleven-inch pot carries a Remo Renaissance head, a No-Knot tailpiece and dual coordinator rods for a solid neck fit and easy adjustments.